That’s correct for England, although some of that is because of a rise in the number of patients being referred for the tests. Last November 13,200 people on the waiting list for diagnostic tests had been waiting six weeks or more, compared to 9,700 in the previous November. That’s a rise of 36%, as Mr Corbyn says. But the number of people on the waiting list was also up, by 8%. Mr Corbyn was focusing his questions on cancer, but these are the figures for all diagnostic tests. This is correct. The NHS in England has an array of targets for cancer care. People with suspected cancer shouldn’t wait longer than two weeks to see a specialist after they’re referred there by a GP, and people who’ve been diagnosed with cancer shouldn’t wait longer than a month to receive treatment. As the Prime Minister says, these two targets are being met, according to the latest figures. About 94.7% of suspected cases were seen within two weeks in November, compared to a target of 93%. And 97.7% of diagnosed patients begin treatment within a month, above the target of 96%. A third target follows the patient from the start of this process. It says that patients shouldn’t wait longer than two months from being referred as a suspected case to beginning treatment. At least 85% of patients should be seen in this time, but as both leaders agree, at 83.5% the target is being missed. It was last met in April 2014, which is 19 months prior to the latest figures we have, for November 2015. As the Nuffield Trust said last year, “comparing health systems is notoriously tricky, as local factors can vary hugely from country to country”. We’ve asked Labour for Mr Corbyn’s source on survival rates. A Welsh government report for 2013 said that Wales had shown the biggest improvement in cancer survival rates out of all four nations of the UK. It said that Northern Ireland tended to have the highest relative survival rates of all the UK countries for how many people were still alive one and five years after they had been diagnosed. It’s not clear if this is still the case. The 2015 version of the same report said that improvements had slowed in recent years, but didn’t compare this to the rest of the UK. 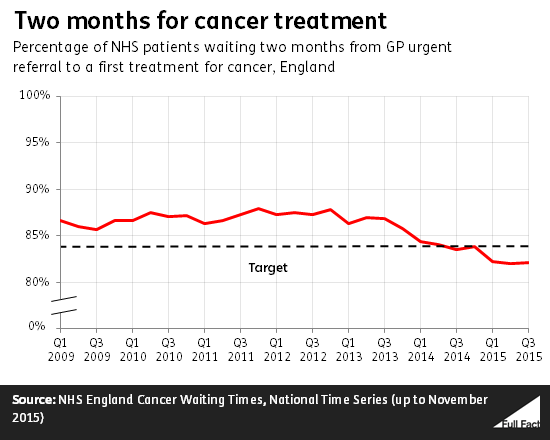 Mr Cameron’s figures on waiting times are broadly correct, except the two month additional wait only relates to one type of heart procedure. The median waiting times for both cataract treatments and coronary bypasses, were 54 days longer in Wales than in England in 2014/15. But that’s not the case for all heart operations—there was little difference between the median waiting times for a procedure which widens blocked or narrowed coronary arteries. For hernia treatments, the median waiting time in Wales was 70 days longer than in England. The median time it took to diagnose pneumonia, influenza and other similar illnesses was 14 days longer in Wales than in England. “Looking purely at performance against the totemic targets (A&E waits, ambulance response times, waits for planned treatment), it is a fact that the Welsh NHS performs more poorly than the English NHS. It’s not in dispute that the government wants to reduce the amount of Employment and Support Allowance (ESA) for some new claimants, from around £102 a week now to £73. The House of Lords recently voted to “delete” this change, but MPs may insist that it go ahead. ESA is available for people with “limited capability” for work. Some are judged able to do “work-related activity”, such as training or working on a CV. It’s future claimants in this “work-related activity group” that would receive less money than existing claimants if the change goes ahead. The charity MacMillan Cancer Support said last month that 3,200 people with cancer are currently in that category. It took this from a letter by Priti Patel, a junior minister, which we’ve seen. Assuming the figure is correct, the Prime Minister is right that those particular individuals wouldn’t be affected by changes to ESA, as the payment reduction is to affect new claimants from April 2017. But it would give an idea of how many cancer patients will get less in future than they otherwise would have. The government says that the “vast majority” of people who are awaiting, receiving or recovering from chemotherapy or radiotherapy should go into the “support group” for people unable to do work-related activity. Cancer patients in the support group will continue to get a higher rate of ESA, although the value of it won’t keep up with rising prices. If you interpret this as the number of children that have come to the UK and been given permission to stay under our asylum laws, it's not correct. Around 2,600 unaccompanied children applied for asylum in the UK in the 12 months to September 2015. All will have made their way to the UK in order to apply, but not all will get to stay. The number who were told they could stay in the same period was 1,300, out of around 2,000 decisions made. The rest were rejected, although some may have appealed—the figures only cover initial decisions. These are the children applying to stay in the UK under the official procedure for granting asylum to people fleeing persecution in their home country. The Prime Minister distinguished them from another group of people that the government has flown over under a specific scheme for Syrian refugees. We added an overall conclusion on the claim about children seeking asylum.